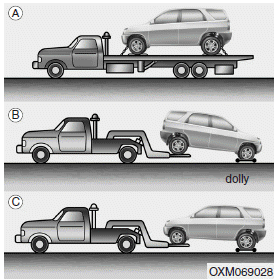 For trailer towing guidelines information, refer to "Trailer towing" in chapter 5. On AWD vehicles, your vehicle must be towed with a wheel lift and dollies or flatbed equipment with all the wheels off the ground. The AWD vehicle should never be towed with the wheels on the ground. This can cause serious damage to the transaxle or the AWD system. 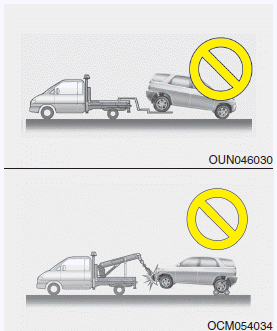 On 2WD vehicles, it is acceptable to tow the vehicle with the rear wheels on the ground (without dollies) and the front wheels off the ground. 2. Place the shift lever in N (Neutral).